In today's post I'm rolling four different things into one. A quick look a one of the Biker Plates from MoYou. Let's start with a look at Pretty Serious 88mph from their Hit the Road collection earlier this year. 88mph is inspired by the DeLorean time machine car in the Back to the Future movies. 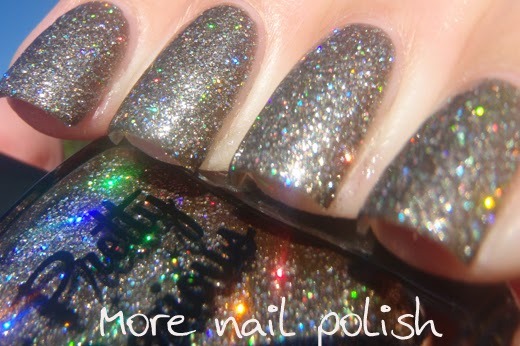 The base colour is a gold leaning pewter shade packed with micro fine glitter and small pewter holographic hexes. 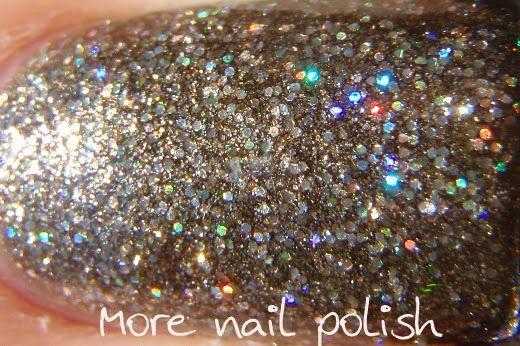 The polish is very opaque for a glitter bomb, you really only need one coat, and a few touch up strokes for full coverage. 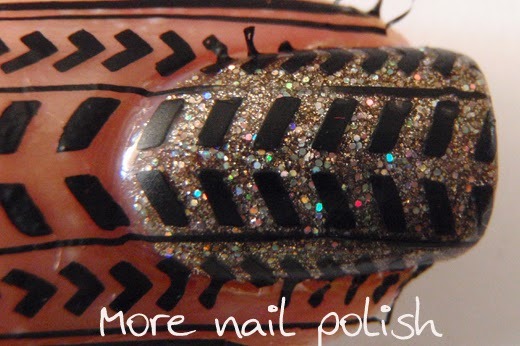 Because of the opacity, it is very thick to apply and a little harder to apply cleanly on the nail. It is also very, very gritty. You could choose to leave it as a textured polish, but it's texture looks a bit thicker and lumpier compared to other textured polishes like the liquid sands. 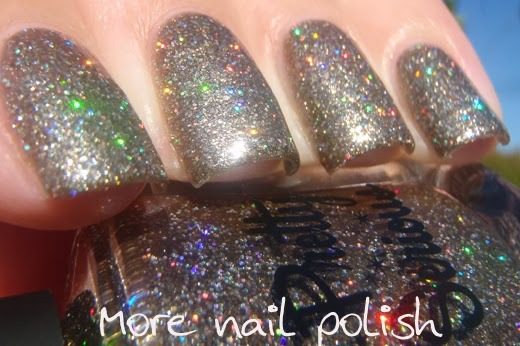 I wanted to make the holo glitter really shine like they do in the bottle, so I applied top coat - and lots of it. To achieve to totally glassy smooth finish I used five (eeep) layers of various top coats. Seche Vite, Essence Gel look top coat, Seche Vite, Perfect Nails Shine top coat and one last layer of Seche Vite. Amazingly I didn't experience any shrinkage and it didn't even feel that thick, probably because the 88mph isn't very thick once it's dried. 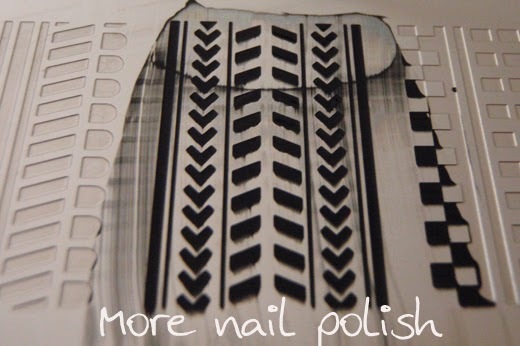 I thought that pairing up 88mph (or any of the polishes from the Hit the Road collection) with some tyre track stamping from the MoYou plates was a really clever idea, and it also gave me an opportunity to show you what I do with the craft masking fluid to protect my cuticles from messy cleanup. I purchased my masking fluid on ebay from an Australian seller. I got two 100ml bottles for $8. There is enough fluid in one bottle to last me two lifetimes, so I gave the other bottle to my mum. I use an old clean up brush to paint the masking fluid directly onto my cuticles after I have done my base colour. You can see that I also aim to flood my cuticles with the masking fluid, because if there is masking fluid in that area, then polish cant get there and make it dirty. Once you have painted your cuticles, immediately wash your bush out with water before it dries stuff and unusable again. Let the masking fluid dry until it's turned completely transparent. Your cuticles will be nice and glossy and wet looking. Be careful not to touch your fingers together once the masking fluid is dry, because it sticks to itself like nobody's business. Once it's stick to itself you may end up pulling your whole masking effort off trying to unstick you fingers. Next up I did my stamping. I'm using my new MoYou biker plate that has various tyre track marks. Like so many nail stamping enthusiasts, I too have gone a little MoYou mad and in just a few weeks I have purchased a whole bunch of plates. MoYou keeps releasing new plates just about every week too, it's killing me! I'm also trying out for the first time the black stamping polish from brand 'Kanda Nails' from the Born Pretty Store. The bottle is the same shape and size (10ml) as my totally empty Konad brand black stamping polish. I was in desperate need of a nice opaque, thick black stamping polish so I was keen to see how this one fared. Scrape - the black polish looks pretty good, nice and opaque. The plate is excellent too. The edges of the etchings are nice and smooth and the depth of them just perfect. This plate is Biker Plate 06 with the XL images and these images are too big for my nails, meaning I don't actually get the full effect of the tyre lines. I wish this plate came in the smaller designs. Pick up on stamper - still looking pretty good. Verdict on the Born Pretty Store black stamping polish from 'Kand Nails', winner - I will happily purchase this again for stamping, and I may just check out the other available colours too. Next, top coat your stamping. 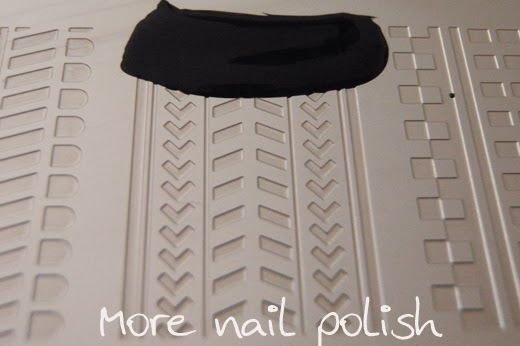 If you don't do this, then you risk the edges of the stamping lifting off where the stamped polish is connected to the masking fluid. Ok, now the fun part. Grab your tweezers and gently scratch away at the edge of the masking fluid to lift the edge. Once you have the edge gently stretch and pull it off. The polish usually flakes off the masking fluid as you go leaving your nail clean underneath. You will probably end up with some parts still attached to the nail. These bits are easily brushed away with a soft fan nail art brush. 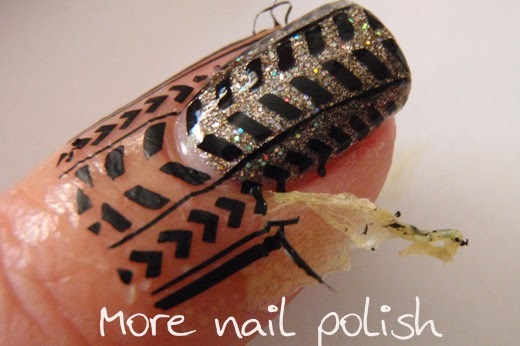 You will still need to do some clean up with a brush and acetone to get totally smooth edges, but because their isn't very much polish on your skin, the process is super quick and pretty clean. Masking Fluid also works brilliantly well at keeping your skin clean when doing gradients or other messy nail art like spun sugar or splatter. 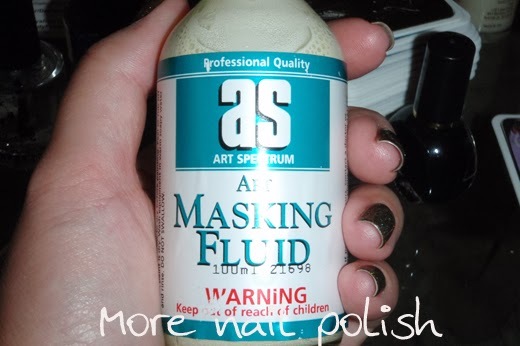 It also works very well at protecting your skin when doing watermarbling. That's where the biggest difference is between Masking Fluid compared to PVA glue. I've tried using PVA glue when doing gradients, but because the PVA is water soluble, it gets wet quickly with the sponged polish and then takes ages to try before you can peel it off. 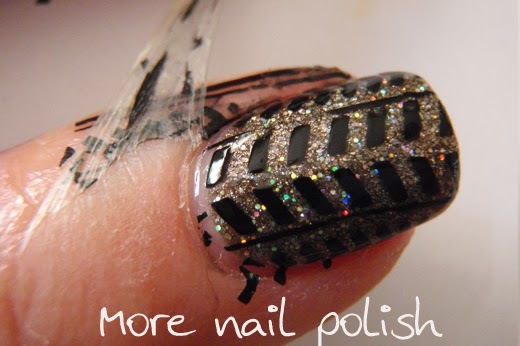 Like wise, you can't dip into water for a watermarble look using PVA glue, as it goes slimy and then takes ages to dry. Once the Masking Fluid is dry it becomes a thin rubber film, so it wont dissolve in water. So there you go, my quadruple barreled review. Please let me know what you think. Lovely! 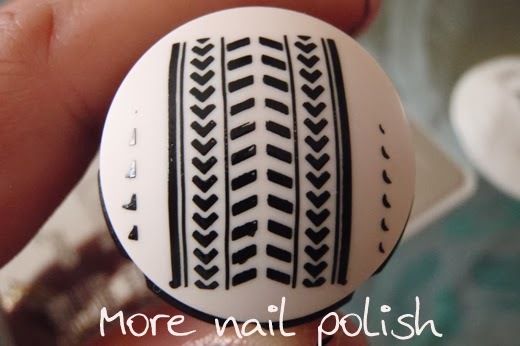 One of the main reasons I avoid stamping with black is clean up, so this is a great tip! I'm curious, in terms of texture is masking fluid significantly different from regular ol' kid's glue? I've used kid's glue before with basically the same results, so I'm wondering if this offers a noticeably superior experience. The main difference from kids glue (PVA) is that once dry, the masking fluid doesn't go sticky again, so you can do watermarbling and have wet sponging polish on it too without it going slimy. Perfect combo of reviews! And thanks much for the photos and info about masking fluid. I'm hoping to purchase some soon and now I feel ready to try it out. As everyone likely agrees - I'm all for more art and less clean-up! :) Thanks!! How long did the masking liquid take to dry? only about 2-3 minutes, it's quicker than PVA glue. Love that Pretty Serious 88mph! Is there any latex in the masking fluid, or any other ingredients that typically bother some people's skin, that you know of? Yes, there is definitely latex in the fluid, infact that is basically what it is, liquid latex. There is also usually ammonia which is used as a preservative to give it shelf life. I would do a test patch first to check for skin reaction. I've been using it for a while, so has my mum and a few friends in a facebook group, none of us have had any reactions.